The “Heroines” finally getting recognition! 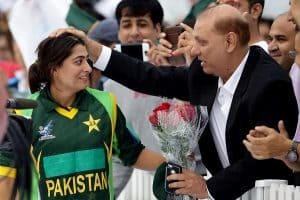 Pakistan women’s cricket team is in the game for past two decades. They have worked hard throughout and finally got recognized when the team got themselves a place under PCB in 2005. But it was not until 2009 they started getting their due share when they won gold in Asian games in 2009. The team won the gold again in 2014. In one of the winning moments it can be seen that the captain’s jersey had a tape due to lack of sponsors. But the struggle of the team is finally bearing fruit as the team just got an official sponsor for their kits and its Bonanza Satrangi. 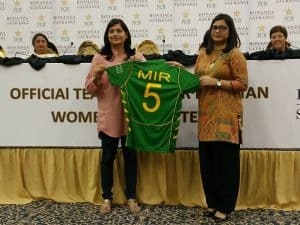 Pakistan Women’s Team Sponsorship and ICC World Cup 2017 Kit unveiling took place at National Cricket Academy Lahore and was attended by ODI Captain Sana Mir and T20 Captain Bismah Maroof among others. 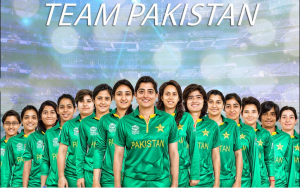 We wish Pakistan Women’s Team best of luck for their future games!